With most establishments having their own business websites running in the World Wide Web, the education department must not be left behind and should be placed at the forefront of this trend. After all, education should always come first with regards to a single person or to a whole community’s development. As important as education is, an awesome website for your school or university is one of the essential things you need in order to encourage youngsters and adults alike to take their roles as citizens through education. 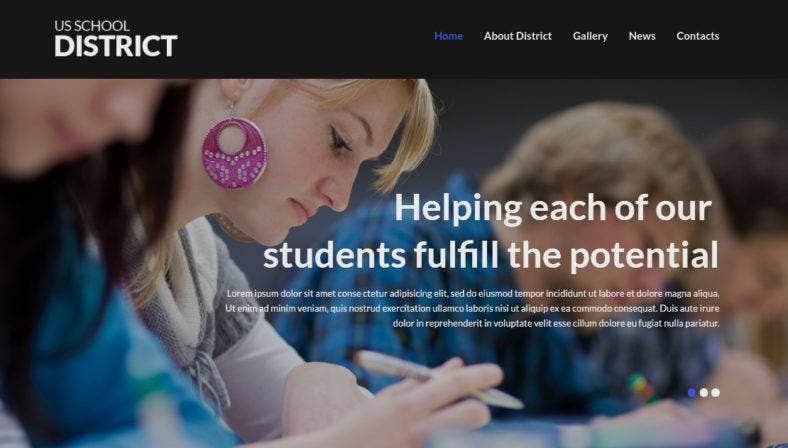 If you are an educator who wants to take part of this change and create your own learning institution, here is an extensive compilation of the best educational WordPress themes and templates that you can use. This collection includes various themes for every purpose and type of school; preschool and kindergartens, elementary and high school, colleges and universities, as well as eLearning and other specialized education. Just browse through this collection and we’re pretty sure you’ll find what you exactly need. 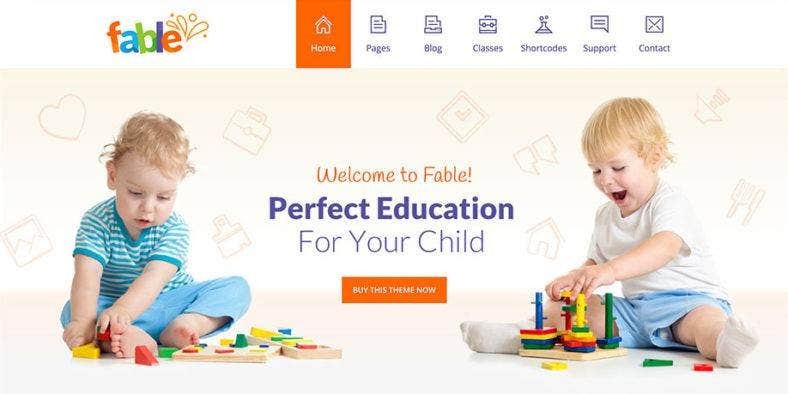 Let us start with Fable, a responsive WordPress theme that best suits websites for child care centers, kindergartens, and nurseries. With a built-in drag and drop Page Builder, you can build your website and create pages in minutes using an extensive collection of components. It also features a one-click demo installation procedure to run a complete website with a single click. Next is Preschool. Obvioulsy, this template is designed with adorable toddlers and preschoolers in mind. It comes with a responsive layout and clean design that are powered by WordPress’ Visual Composer and Revolution Slider. These plugins give the theme its versatility and flexibility so you can build your website according to your needs or preferences. 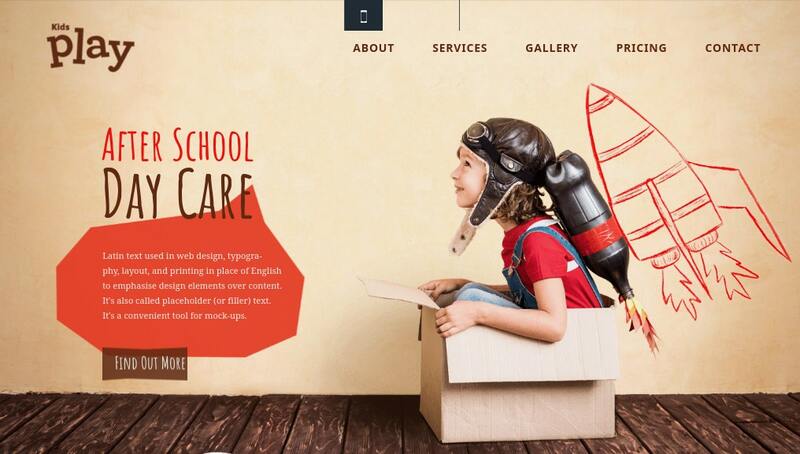 Kids World, on the other hand, is a multipurpose WordPress theme especially dedicated for kids. 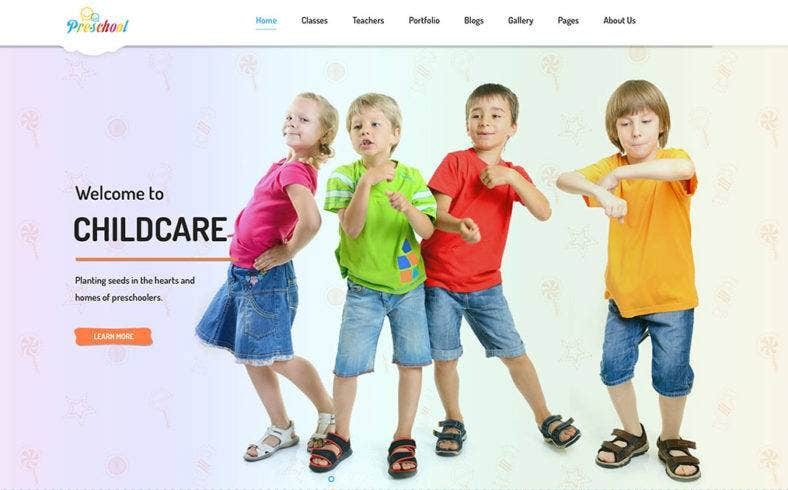 It can be used to create daycare, kindergarten, and preschool websites with its unlimited choices of color and design. This colorful theme is also packed with awesome features such as 9 fascinating homepages with nchanting graphics, vibrant colors, and attractive icons. 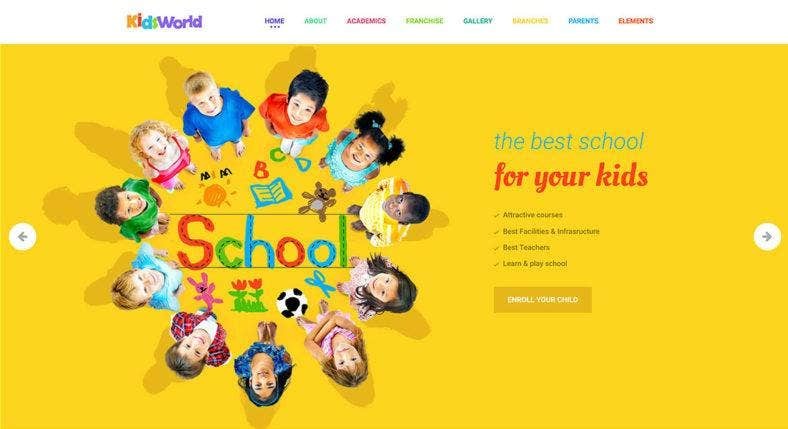 Another colorful template is Primary, a unique WordPress theme perfect for professional child care centers, preschool, and kindergartens. It comes with a vibrant design made with trending Material design colors and is integrated with lots of premium WordPress plugins and a full UI set. All these make this template an excellent choice for your primary school websites. Built with the powerful Bootstrap framework, Priskul is a simple yet powerful WordPress template as it features a responsive design that supports all device and a strong drag-and-drop content with LayersWP, so you can create a stunning website while keeping the basics and fundamentals of a good web design. It is clean and stylish perfect for any education website. With a full-screen header with amazing animations and a one-page layout with parallax effect, Kids Play is definitely one of those WordPess themes that are truly eye-catching. Also loaded with various awesome features such as the Visual Builder, Revolution Slider, Color Pickers, WooCommerce ready, and more; this theme is suitable for any kids related websites. 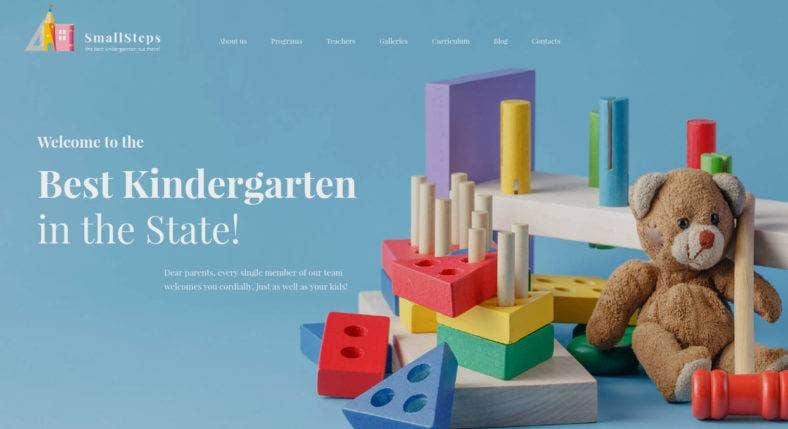 This kindergarten WordPress theme is fully responsive and SEO-friendly template that will help highlight your best kindergarten services and offerings. Smallsteps features a powerful TM Gallery, a Timetable plugin, a large number of Content Modules, multiple types of content pages and blog layouts, versatile header and footer styles that makes your website look special. 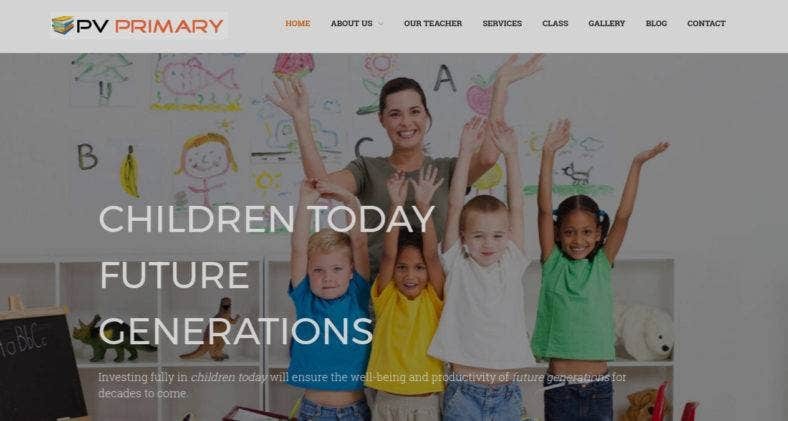 Primary School is a clean a simple WordPress theme that is intuitive and easy to use. Among its features is a responsive design that is fully editable with custom post types and formats, 80+ shortcodes that you can use, multiple color options, custom widgets, customized typography, fantastic sliders, and much more. The theme is also easy to install with a 2-step installation. 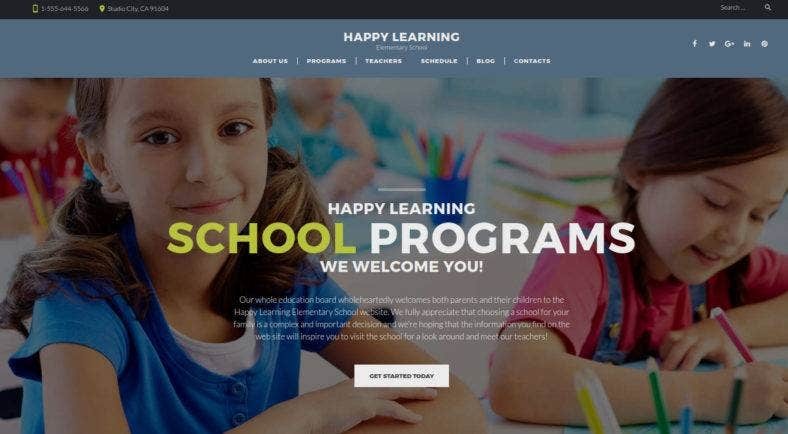 Another primary school WordPress theme is Happy Learning. This responsive theme is created using Power page builder, a drag-and-drop tool which helps you to construct pages and posts easily. 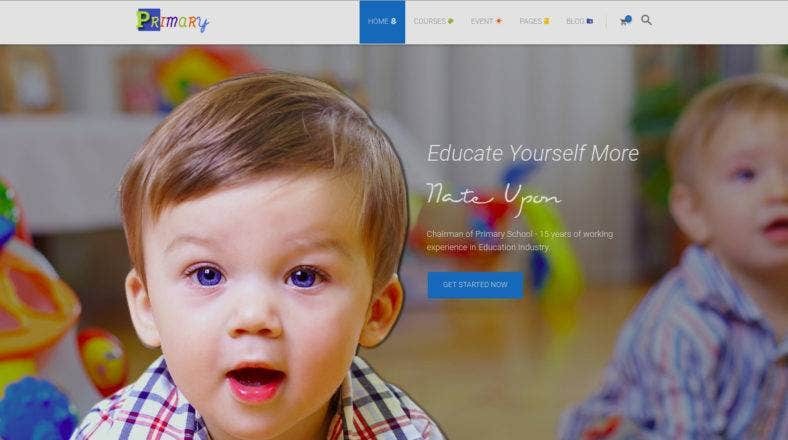 With a bright color scheme and easy-to-navigate layout, it works well with different types of education websites especially for kindergartens, nurseries, and preschools. 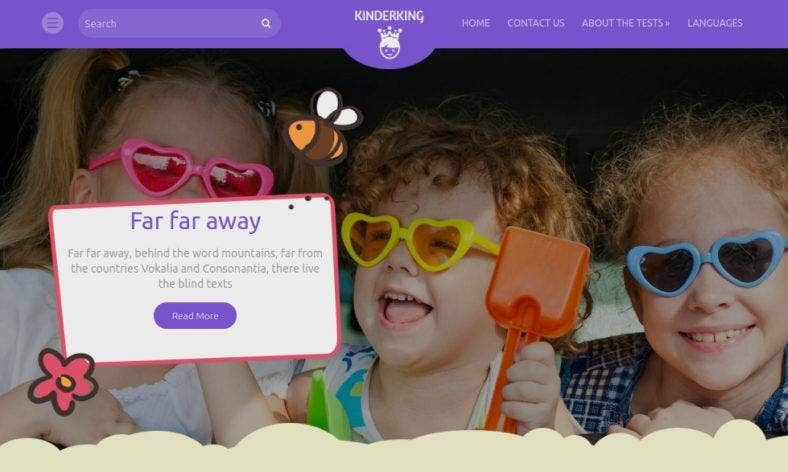 A free WordPress template, KinderKing is initaliiy created as a personal website theme but it can also be used for preschool and other school establishments websites. It comes with a lovely child interface over a cutting edge design, that will surely catch every mother or child’s attention. The theme is also fully responsive, SEO optimized, and WooCommerce supported. 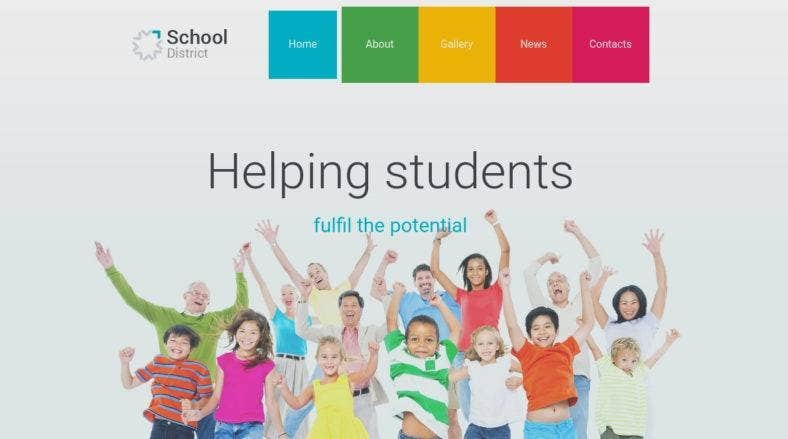 Ed School is an elementary, middle school and high school WordPress theme used to create school websites. Packed with tons of useful and powerful features, including a drag and drop page builder, premium plugins Visual Composer and Revolution Slider, unlimited colors, a collection of Google Fonts, and a Mega Submenu for high flexibility. and functionality. 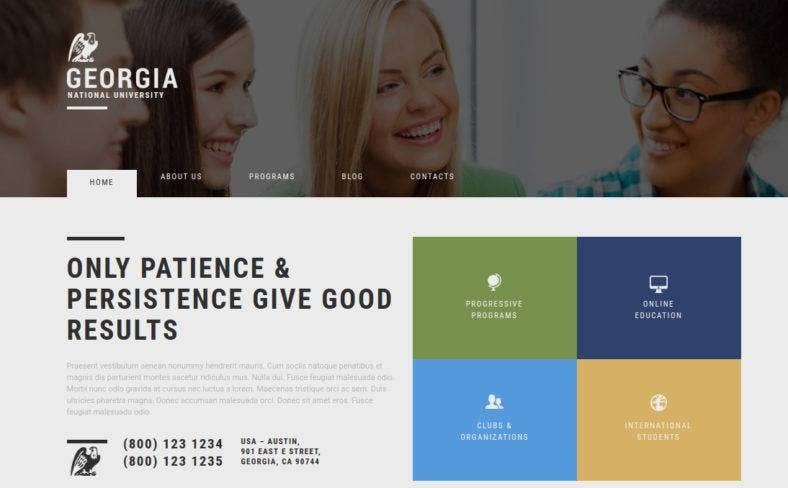 Eduma, on the other hand, is an education WordPress theme that is not just used for elementary and high school websites but also for colleges, academies, and even universities. With its rather clean and professional design; along with a seamless lesson design, LearnPress 2.0, new Ivy League Demos, and Visual Composer; the theme is lightweight, fast, stable, and scalable. 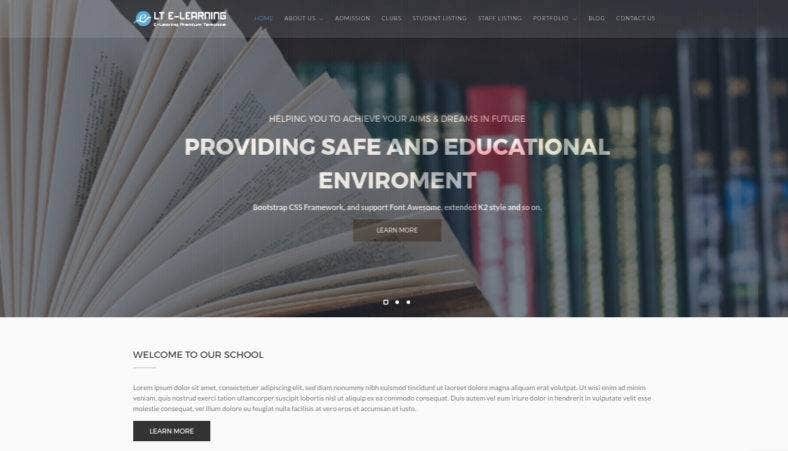 Lincoln is a another clean and professional WordPress template that uses Material Design for educational organizations such as high schools, universities, and learning centers. It features 8+ different and unique homepage demos, custom sidebars, user profile template; and i sensures to work seamlessly with LearnDash, the most popular Learning Management System. 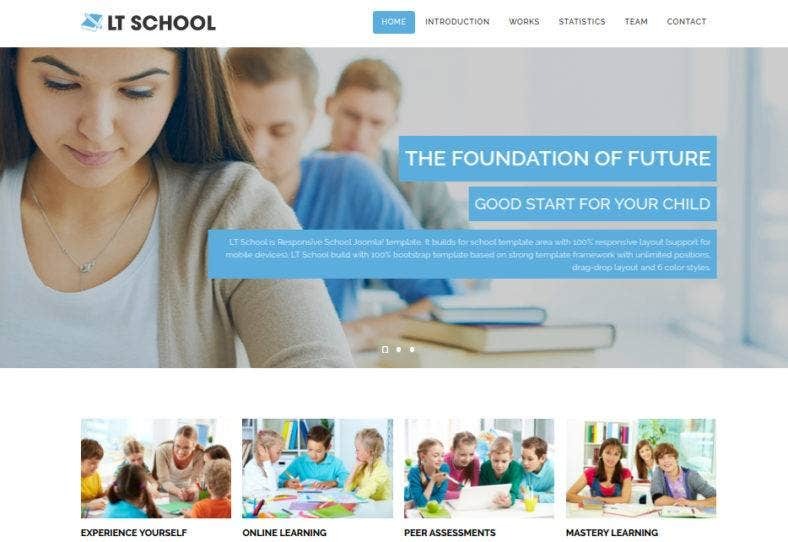 A one-page WordPress template, LT School presents a clean and modern design with a responsive and mobile-friendly layout that makes sure your website looks good on all devices across different screen sizes. It comes with lots of advanced features, highly customizable options, a wide variety of gallery and portfolio layouts, unlimited colors, and much more. As it name implies, the WordPress template presented above is used to create an education website that provides an impression of success by the students and satisfaction by the parents. 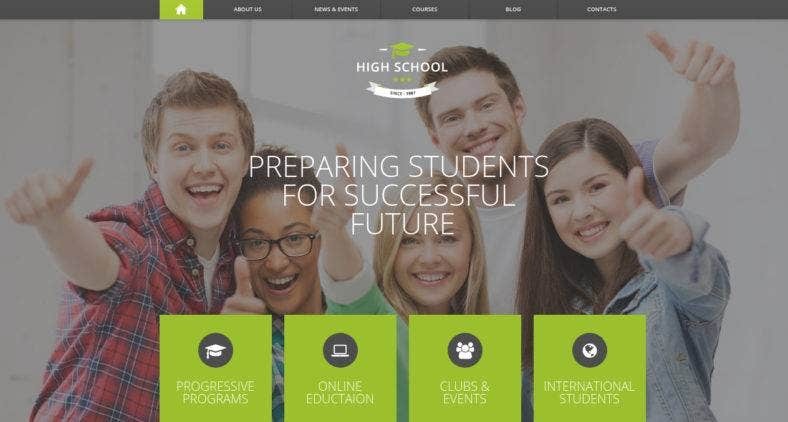 High School‘s main features include a responsive design, parallax effect, SEO integrated, widget-ready design, ready-to-use shortcodes, functional navigation settings, and more. A highly professional yet fun theme, EduKING is a responsive WordPress template that has a responsive and mobile-friendly layout with an easy-to-use Theme Options Panel. This theme is also easy to customize with unlimited colors, custom shortcodes, a number of custom widgets and custom page templates, events integration, gallery options, and a layer slider. 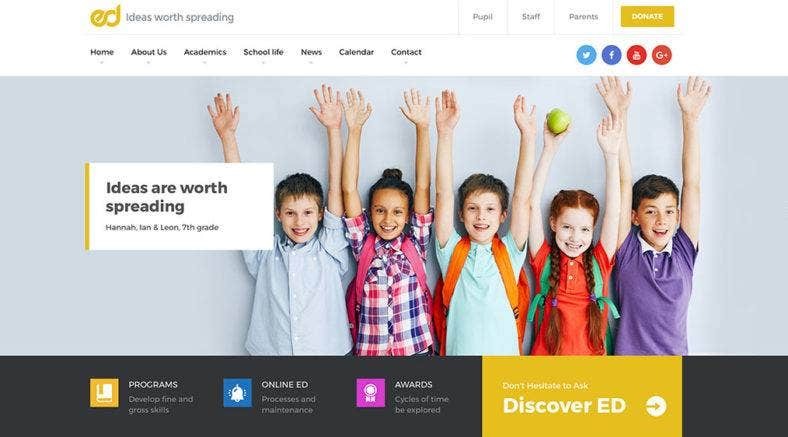 This elementary school WordPress theme comes with a rather clean and minimal design compared to the rest of the templates presented on this list. With a responsive design, this theme is also fully editable with customizable post types and post formats, various coor options, filterable portfolio, custom widgets, fantastic sliders, and awesome typography. 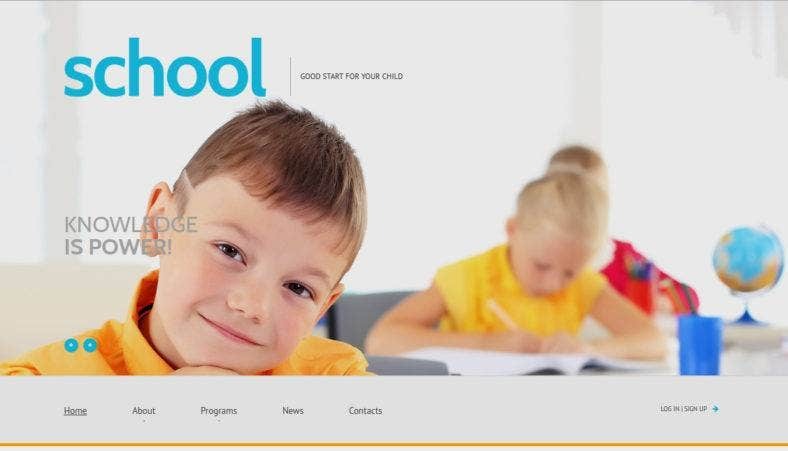 On the contrary, School District offers bright and sunny color over a stark white background perfect for any education related websites; particularly preschools, elementary, and high schools. 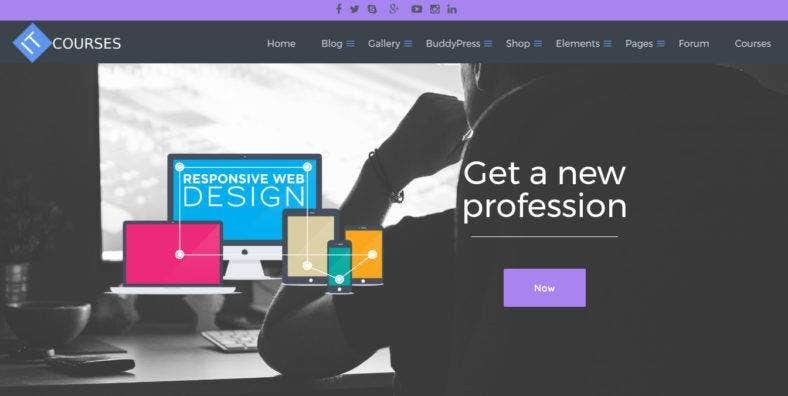 This WordPress theme has a responsive design with scalable graphic elements like fonts and icons as well as a parallax scrolling effect, so your website looks great anywhere. 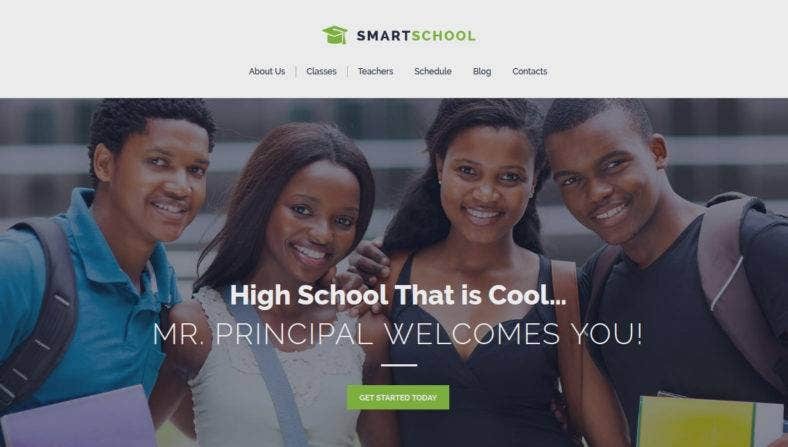 Smart School is a responsive education WordPress theme that is built with Power, an excellent drag-and-drop page builder that lets you create a working website even without touching a single line of code. It also includes multiple layout options and various content modules to personalize your website easily. It features an Appointment Manager and Timetable plugin. An unconventional and unique WordPress theme, Schoolmaster is dedicated for high school websites. With its choice of pastel color schemes, an informative layout, multiple banners, and a news block; it provides your website a friendly and familiar feel. It also features a menu with fly-out subcategories in addition to dropdown categories to organize rich content. For a more mature design appropriate for colleges and universities, Masterstudy is the best template to use. This education WordPress theme works with every education-based websites, from small education centers to big learning insitutions. It can also be used by professional coaches and independent tutors to market their products or services. Kalium is a multipurpose and creative WordPress template that includes a beautiful theme demo for education. Among the cool features it include is the most popular content editor Visual Composer, the best-selling Revolution Slider and the popular Layer Slider for WordPress. The theme is definitely gorgeous to look at as well as it is easy to use. 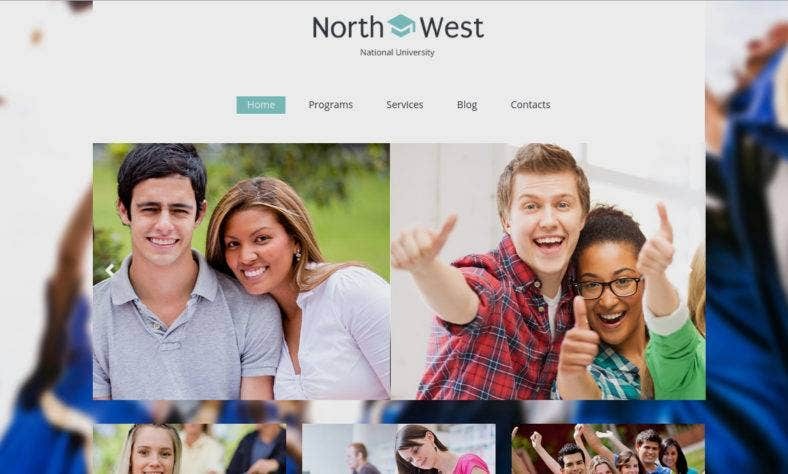 A modern WordPress theme designed for university and college websites to help students and enrollees find information regarding the institution they or long to belong to. 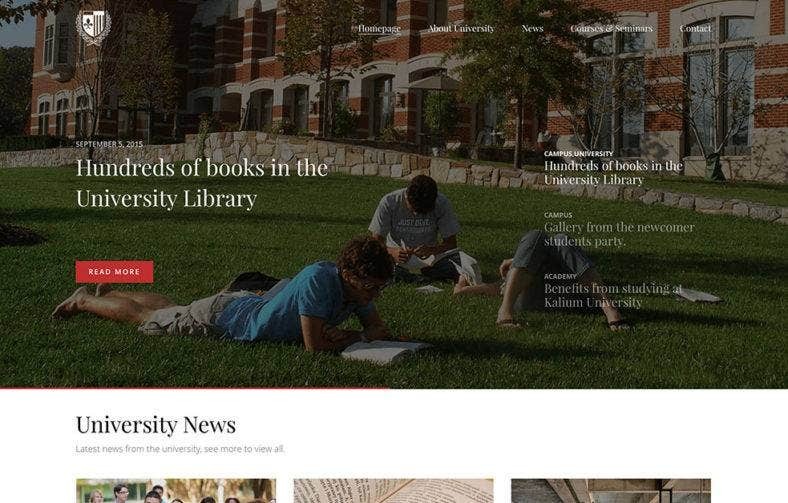 LT University is a mobile-friendly theme that works well on all devices. It features lots of advanced options like strong shortcodes, highly customizable theme options, and a color picker in the admin panel. Made to be a suitable choice for websites of educational establishments like colleges and schools, including training services and online courses. Ethics is multipurpose WordPress theme that comes with powerful admin panel and outstanding features which make this template the right and the perfect tool to run a highly functional and extremely professional website. 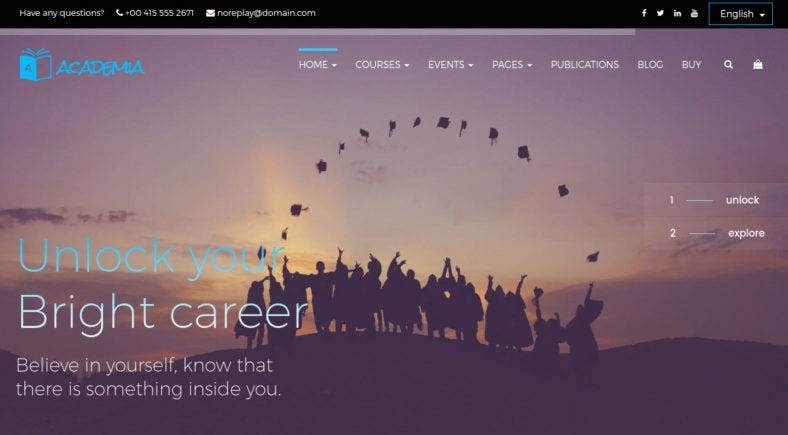 Based on OS Base WordPress framework, IT Courses is a beautiful premium WordPress theme for IT colleges that allows you to create custom layouts for your content and configure every element without any coding knowledge. It uses LearnPress, one of the most popular learning management system that features a drag-and- drop curriculum management tool. 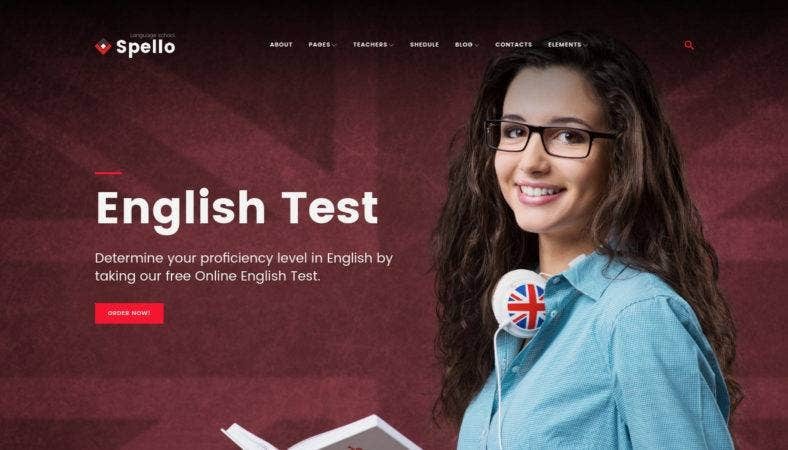 Georgia is another university WordPress theme that gives your educational institution a stunning online presence that your resident students and student applicant will surely love to browse. With a classic Cherry layout packed with useful Cherry options, this theme is also high in functionality to deliver an amazing user experience to your viewers. 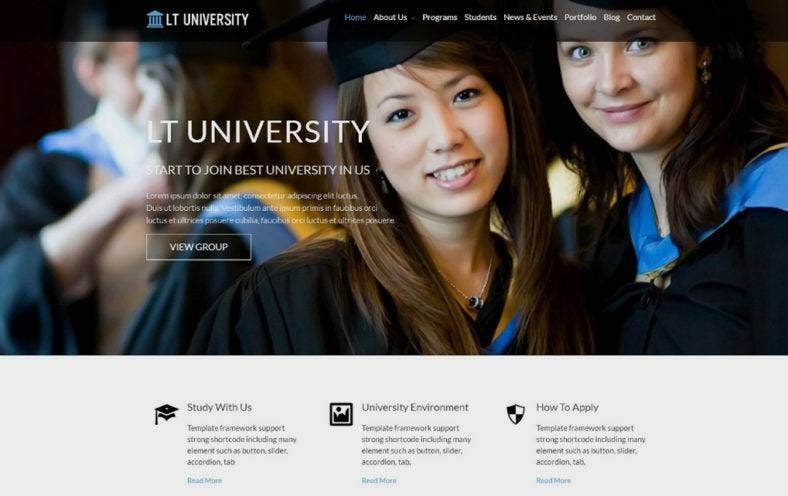 This dark themed WordPress template offers a highly professional and polished look for any univesity or college website. District is a modern theme that comes with enough space to display each course and lesson with a short description to add. It is SEO optimized and includes a full WPML plugin support, so you can start education website with endless possibilities. 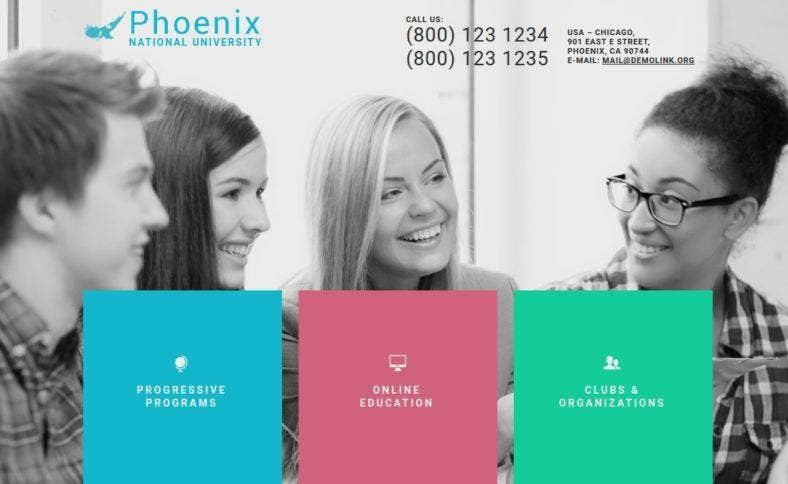 Phoenix, on the contrary, presents a rather colorful design scheme to provide a rather fun and interesting appeal to its users. Despite the use of bright colors, this theme has a clean and elegant layout that draws the veiwer’s attention to important details. It also features a large hero image with a cool hover effect and a grid-based list to provide a great visual presentation. To create a flexibe and functional web presence for your education websites, use this WordPress theme that is built on Cherry Framework 4.0. With a fully-functional design created with valid coding, a modern and unclattered layout, and integrated with lots of powerful features, North West will help you transform your website to meet your business needs. Academia is another responsive education theme for WordPress with a couple of home page options, unlimited color variation, and add-ons that enables you to create the perfect website that you’re dreaming of. It also features ready-to-use pages, an event calendar, courses and teachers pages, and more unique attributes that boost your website’s functionalities. 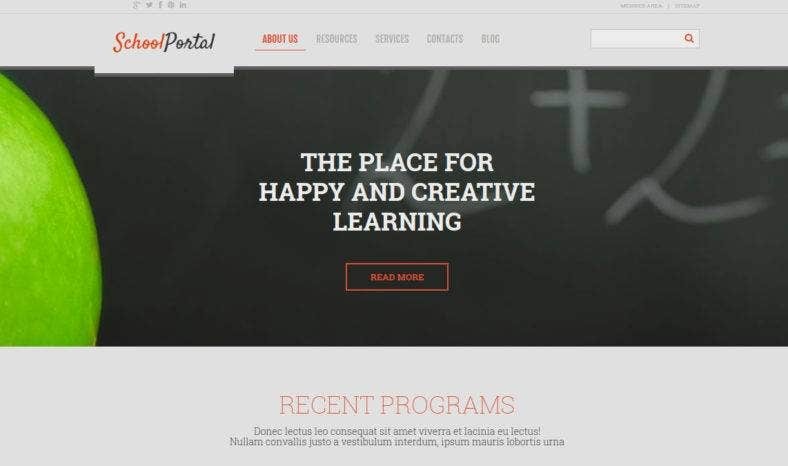 This theme is a Learning Management System template for WordPress that is powered by Visual Composer. 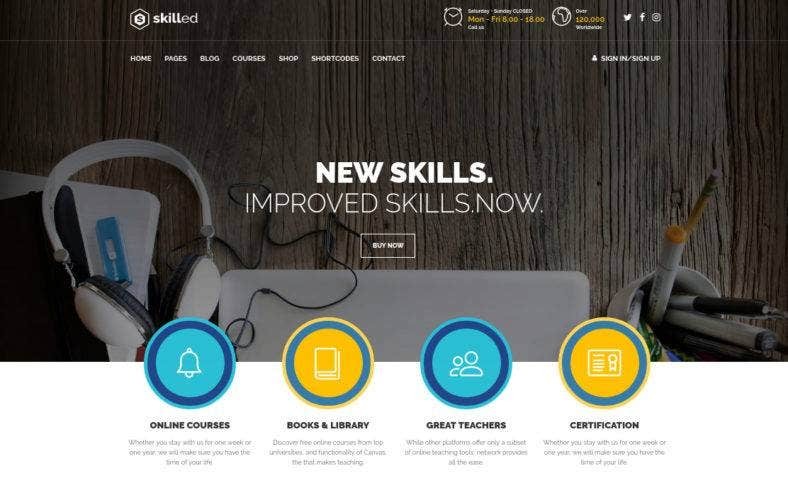 Although this theme is designes especially for creating and selling courses online with a WooCommerce support; it is also suitable for schools, universities, and colleges as well as for private tutors and individuals who want to share their knowledge. 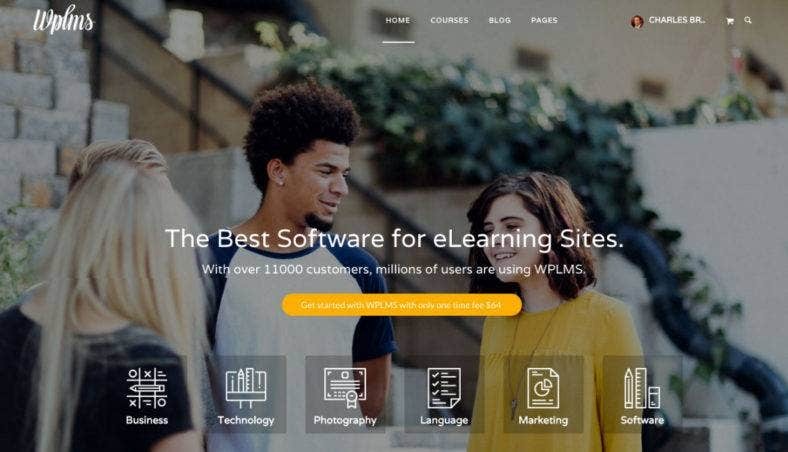 WPLMS, which obvioulsy stands for WordPress’ Learning Managemant System, is another LMS theme that is not just an education theme but a complete eLearning template for course management as well as instructor and student management. Educational training centers or corporate trainings and coaching businesses can use this template to sell courses online. Another eLearning WordPress theme, LT eLearning is a responsive template that is built from a powerful framework with full Bootstrap supporting shortcodes, a drag-drop layout content, and unlimited color variations to help you create attractive websites with various layouts. The theme is tailored for eLerning websites which enable you to sell online courses and classes. Course Lady is a bold and vibrant WordPress theme exclusively made to cater course creators and eLearning service providers. This Lifter LMS template allows you to create courses and organize them by sections and lessons, setup different payment plans, manage students, create drip content and more. It gives you complete control over the look and feel of your website. Spello is a language school WordPress theme that comes with bright backgrounds and catchy tones that will surely engage your visitorRS. It features an easy-to-navigate layout that delivers the joy of browsing, an intuitive website slider whihc highlights your special offers and raises brand awareness, and a drag-and-drop page builder to craft a unique online presence on the fly. This online education WordPress theme helps your website stand out among other online school websites. Tutoring is a contemporary template perfectly tailored for education websites with a pretty traditional web design. It also boasts of an easy-to-read and understand content, intuitive navigation, and visually appealing aesthetic that will surely make people interested. 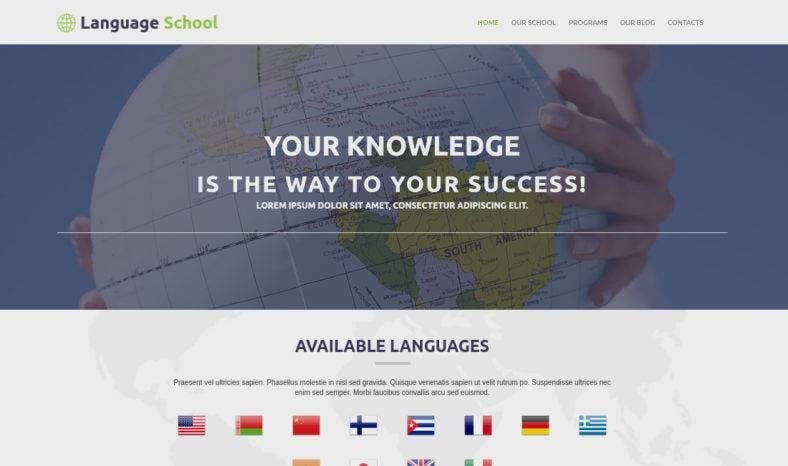 Another language school theme but with a rather clean and simple aesthetic, this minimal WordPress template comes with an authoritative look thanks to its dark blue and green background. Other features includes multiple color options, custom pages and widgets, customized typography, filterable portfolio, and others. 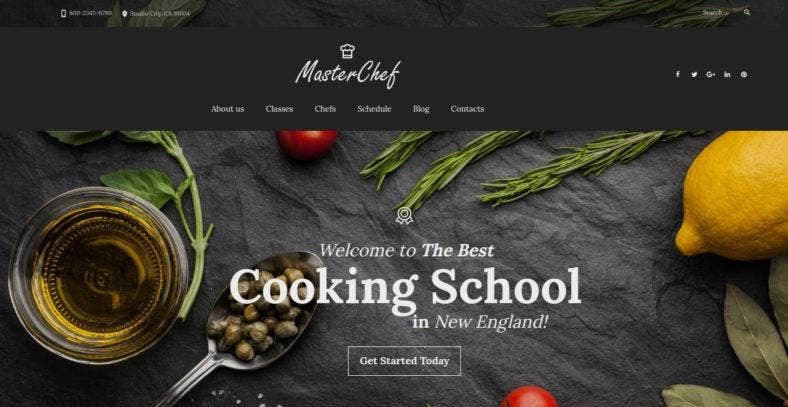 If you’re looking for a dramatic WordPress theme for your cooking school, then here’s the Master Chef template that is just right for you. It features multiple layout options, content modules and custom widgets. With the help of WordPress Live Customizer, this theme will help you showcase your cooking classes as well as culinary outputs in a stunning way. To end this list, here is SafeDrive. 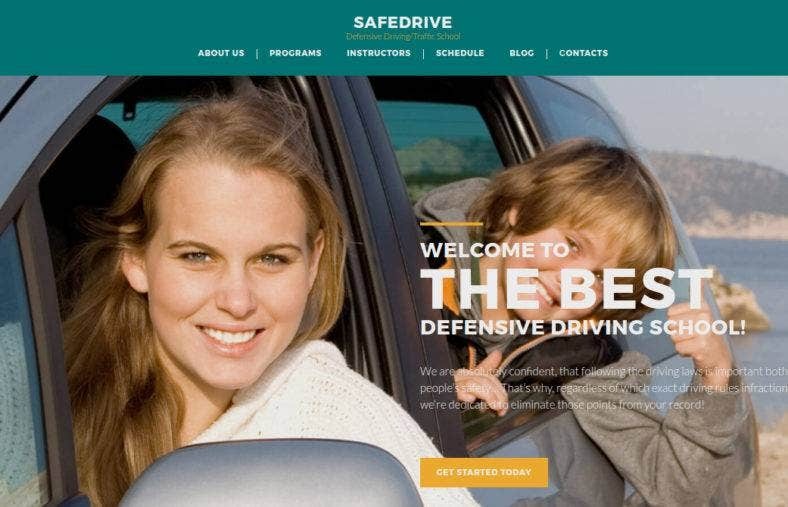 A driving school WordPress template that will make your website look modern and provides it with functionalities that will make it work efficiently. It features aA drop-down menu, testimonials section, integrated Instagram, elegant image slider, the team presentation box, hover effects and neat social media widgets. If you want to build an excellent website that is dedicated to learning, then this article is your ally. With these carefully selected and curated themes, you will definitely be able to provide all necessary information an eager learner or guardian needs in order to get the proper training and discipline he or she needs to become an able contributor to the society. Some of these templates enable you to offer online courses and other education services. 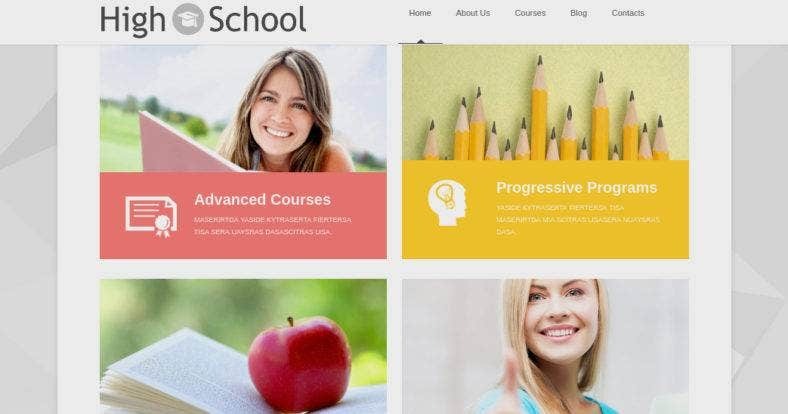 So, or more inspiration and ideas, you can also take a look at our compilation of top online education WordPress themes and templates.